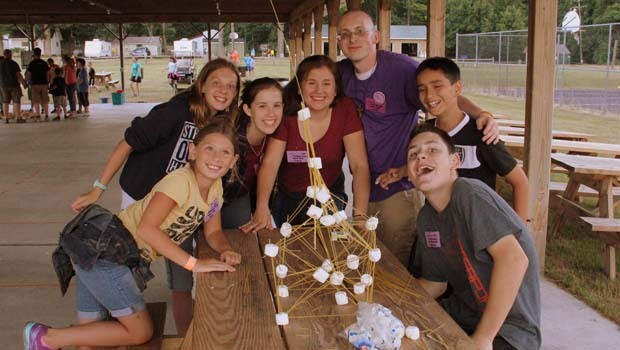 Simpson Park Summer Camps 2019 – Info for Summer Games camp, a Christian faith-based camp, for kids ages 9-15. Simpson Park Camp provides a distraction-free, back-to-nature setting for your child to spend the week. Your child will experience intentional opportunities to encounter Christ personally through worship, prayer, praise, speakers, witnessing by teens, games, evening programs and music in an atmosphere that is safe physically and emotionally. It will be a week of non-stop fun and learning. They will make new friends, sing new songs and dive into God’s word for a deeper walk with Christ. They will want you to send them back again year after year. Summer Games camp is designed with your child at their age in mind. Help your child create lasting relationships and memories for a lifetime. The Summer Games Camp provides a place and an opportunity for your kids to grow into the Christ-like person God intends them to be. The multi-age grouping, called huddles (like small families) help develop skills for effective discipleship and witness to the world. The highlight of the week is the Summer Games “crucifixion pageant” on Thursday night, which is followed by a resurrection and communion service on Friday morning. Christian leadership is developed by giving youth the opportunity to be responsible for themselves and those younger. An important aspect of Summer Games is that the huddle leaders are close enough in age to the campers to serve as role models and peers. Each huddle is led by one teen girl huddle leader and one teen boy huddle leader all day, offering each camper individual attention. Summer Games camp has been in Michigan since 1991, and part of Simpson Park Camp since 2005. Costs include programming, recreation, crafts, lodging and food for the week. Enroll campers and huddle leaders for an enjoyable and rewarding camping experience this summer! Summer Games Camp costs $270 for the week. Simpson Park Summer Camps 2019 Discount – A SPECIAL is being offered for first time for Summer Games Camp attendees. Pay $220, a savings of $50, if you register before 5/31/19. Visit www.simpsonparkcamp.org for more information about Simpson Park Camp.